The post I wrote about this wreath was the most popular post of all time on my blog (before I deleted the whole blog and started fresh). I still get emails about it occasionally. I figured it was worth posting again with a few words about how to make it. Here is a close-up shot. 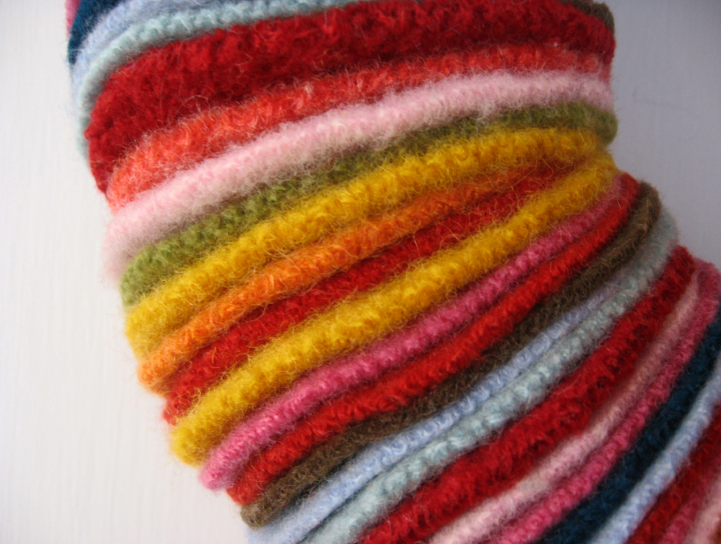 Create a collection of second-hand wool sweaters in various colors. 100% wool sweaters work best, but anything over 90% will pretty much work. I tend to grab sweaters throughout the year when I’m shopping at thrift stores. Wash the sweaters with soap and hot water so they felt up tight. Cut a circle template out of paper. I used the opening of a coffee cup as a guide. 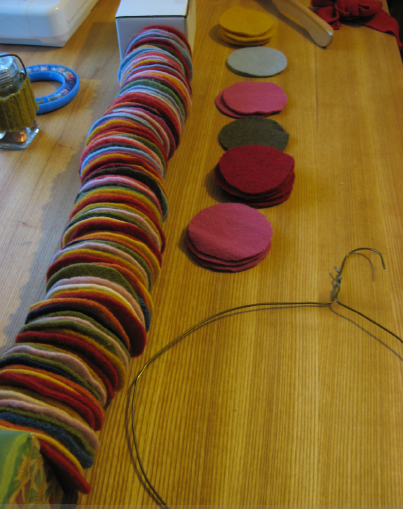 Pin the paper circle to the sweaters and cut circles out, over and over again, until you have enough to fill a wire hanger. You’ll need to untwist the hanger and shape it into a circle with your hands. When you are done cutting out the circles lay them out on a table and start sorting them in a way that is pleasing to the eye. Then lace all the circles onto the hanger. This is the easiest part of the process and takes very little time. Twist the hanger back closed and hang. You might want to bend the hook back a little with a tool so the wreath hangs flat against the wall. The whole process is easy but time consuming. In the end you’ll have a colorful, modern, handmade wreath. approximately how many circles did you have to cut? I think somewhere between 120-150. It is going to depend on the thickness of the felted sweaters. Good luck! how big in diameter were the circles you used? Sorry it took so long for me to respond. It took me a while to find the template I used. I found it and measured it. The diameter of the circle template is 3 and 1 quarter inches. I think this is a fantastic use of old materials, and just what the Woolly Hooligans is all about. We can make so much with what we already have in the world, and not just beautiful things for ourselves and our homes – but also useful items too. MOre blogs to follow with tutorials on what you can do with your old fabric, sweaters and more. Thanks Jennifer for the great idea!